I have had something in my head for a couple of days and I know I need to get started on it or I will just keep thinking about it and not be able to sleep. I haven't sewed since before Christmas so wish me luck. Still deciding if I want to use the green leaf print from Park Slope with this mix?!?!? Love it! 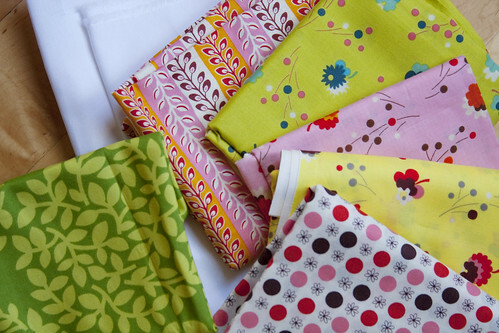 Anything you make with those fabrics will be good. I think you need the green as a strong anchor color. It still has yellow in it to fit in. Maybe just use a very small amount of it. I think the green works! Agreed! The green will work beautifully. Sewing is so therapeutic! Hope you're doing better! Yep - I think using a little bit o' the green will work! Those are such great colors together, very spring-y! I think the green is a must! It brightens the quilt. I know about not being able to sleep with a plan in your head and it is a good sign you want to sew again, isn't it. Enjoy it!